Have you seen the Kids’ Zone? Play games and visit some cool websites. You can vote for your favourites. This is our nursery web page. We will use it to show you all of the fantastic things that we will be doing in class. We will update it regularly!! Mrs Crossley and Mrs Fennell: Teaching assistants. Our topic this half term is Paws, claws and whiskers. We will be finding out about domestic cats and wild cats. We will have a vets role play area in class. 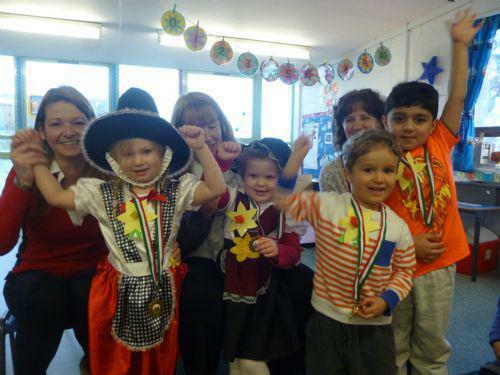 This half term we will celebrate St Davids Day, Mothers Day and Easter. 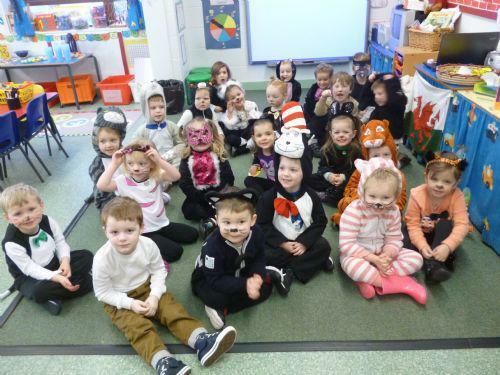 We will end the term with a cats dressing up day. The children will be learning the sounds c, k, u, b and f. They are making great progress. Please keep working hard at home too. We are going to have a number focus this half term and will be working hard on recognising numbers to 10 and beyond. Please see the class newsletter at the bottom of the page for more information. Many thanks to those of you that have already paid fruit money. The cost is £2.50 this half term. Please could it come to school as soon as possible in a named envelope. End of term: Thursday 24th March. Congratulations to all the children on a brilliant Eisteddfodd. They all really enjoyed it and had lots of fun. See the article below for all the results and photographs!! Grwp Oren: Singing competition winners!!! Important: Please could we respectfully ask that parents do not come into the nursery cloakroom. The children are learning to become independent and we are always on hand to help them if it is required. Please could we also ask that no toys come into school. Many thanks for your help and cooperation in this matter. This week we will be revising sounds and finding out what we all know. School opens again on Tuesday 12th April. We hope that you all have a fantastic Easter!! Having fun in the outdoor area. Learning to pedal the bikes. Fflic a Fflac, our Welsh puppets!! Using the i pads to develop counting skills. Developing listening skills and a love of stories. We have been making animal homes. Each day we are learning to write our names. Discovering food, using our senses. Creating a new role play area. aaa "around the apple and down the leaf." Having a go at forming aaa. Rolling a ball with a partner. Pa liw? selecting the correct colour. Making owl sculptures using clay. nnn "Down Nobby, over his net." We had a visit from Morrisons. Chinese New Year- Using chopsticks!! We are getting really good at name writing! Mrs Lynch- The Veterinary Nurse came to visit. World Book Day- Wizards and Magic!! We had a teddy bears picnic! Maria and Sue from Morrisons came to visit. ICT "What did we have for breakfast?" Holes, spaces and hiding places. Learning to write our names. Using i pads for the first time. Our first indoor PE session in the hall. We have created pictures using the 2simple programme. Roald Dahl dressing up day!!! Welsh Phrases for Home Reinforcement A selection of phrases that parents can use with their child to encourage the use of Welsh at home. Read Write Inc phoneme pronunciation guide. How to correctly pronounce the sounds that we are learning.